Family-owned and operated for over 30 years, we at Southern Septic and Lift Station Corp. have proudly provided top-quality septic tank and lift station services to Homestead and the surrounding areas for decades. We pride ourselves on offering top-quality work at the best price possible. And how do we meet this promise of best price possible? With our guarantee to beat any reasonable proposal from other Miami septic and lift station services. That’s right: With Southern Septic and Lift Station Corp., you don’t need to shop around to get the best price possible for your septic tank and lift station services! But though you’re getting septic and lift station work for cheap, the quality of work you’ll receive is anything BUT cheap! With over 30 years of experience, we at Southern Septic and Lift Station Corp. have become masters at what we do. We provide only the highest-quality service and products for your septic tank or lift station. Because of our dedication to excellent service, you can rely on a job done by Southern Septic and Lift Station Corp. to stand the pressures of time and everyday wear and tear. Thus, we continue to save you money by preventing future septic tank or lift station repairs and replacements. Whether you are building a new home or replacing an old septic system, you’ll need a qualified septic tank expert who won’t overcharge you for the service. And thanks to the experts at Southern Septic and Lift Station Corp., that’s exactly what you’ll get! Quite a bit of work goes into having a new septic tank system installed. First, you’ll need a workable design for your septic tank. This means you need to know where to place your septic tank so that the slope from your piping is steep enough and so that it is out of the way without being impractically far. Then you need your design to be approved by the city. This process can take quite a long time if you don’t know what hoops to jump through and whom to send the paperwork to. Finally, you’ll need to get the equipment together, and this equipment can be EXPENSIVE: a backhoe, a grading pole, risers, and of course, the septic system itself. Plus the knowledge to install it correctly. 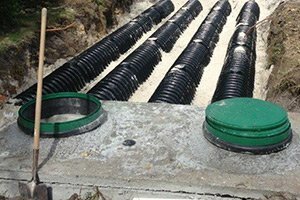 If you don’t want to go through the hassle of designing a working system, handling the paperwork, and assembling the materials, then just call the experts at Southern Septic and Lift Station Corp. We’ll handle every step of the process, and with our promise to provide top-quality service, you can sit back and relax while we give you the perfect septic tank at the best price! The drain field is a vital component of your septic tank. 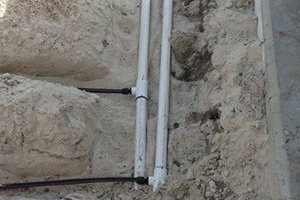 There are a number of signs you can observe if your drain field system is failing. You might detect odors near your septic tank. Your toilets might flush sluggishly. There might be wet spots above the septic tank or drain field. And of course, your plumbing installations might begin to back up. If your septic tank’s high-level alarm is working, then it could go off. The second you hear that alarm -- or the second you observe any of the other signs of a blocked drain field -- you need to contact Southern Septic and Lift Station Corp. We can get your septic system moving again in no time and at an affordable rate! If your drain field system is running poorly, don’t piddle around and try to band aid fix it. Just get a new system installed. Here at Southern Septic and Lift Station Corp., we excel at new system installations. Don’t live with a poorly functioning septic tank system. Let us make it like new again! Installations can be expensive, no matter how great a price you get for the job. And when you’re experiencing septic tank or drain field problems, the last thing you want to deal with is a full-blown replacement that will eat into a large chunk of your time and wallet. If you are experiencing septic tank issues, then don’t fret over the thought of having to replace your entire system! Many problems can be addressed with a simple repair! 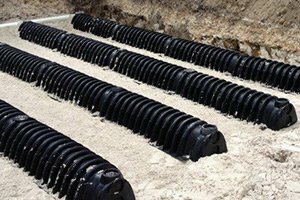 Maybe only a part of your drain field system is giving you troubles. Or maybe your septic tank’s overflow alarm is failing to go off. Maybe you’re experiencing a variety of little issues that culminate in the big issue of your septic tank’s failing to function properly. If you are looking at the big issue of a poorly functioning septic tank, don’t lose heart! Just have simple septic tank or drain field repairs done by the experts at Southern Septic and Lift Station Corp. With our decades of experience, you can be sure that you’re getting nothing but the highest-quality repair done. We have the knowledge and the skills to make sure every repair is done right and made to last! And with our promise to match any reasonable price from our competitors, you can be sure that you’ll be getting that top-quality service on a dime! Don’t live with a poorly functioning septic tank. Just have a top-quality, affordable repair done by the experts at Southern Septic and Lift Station Corp! We have all of those characteristics and many more. We pride ourselves on providing top-quality septic tank and drain field work to all residents and businesses in and around Homestead. Nobody should resign themselves to dealing with a poorly functioning septic tank and the unpleasant results that come with it. Thanks to the experts at Southern Septic and Lift Station Corp., you won’t have to. And thanks to our price-match guarantee, you won’t have to pay a mint just to enjoy a properly working septic tank. When Should I Get My Septic System Repaired? What Causes My Septic System To Back Up? If you’re experiencing issues with your septic tank or lift station, then call the experts at Southern Septic and Lift Station Corp. today at 305-598-8266 or complete our online request form. SOUTHERN SEPTIC AND LIFT STATION CORP.